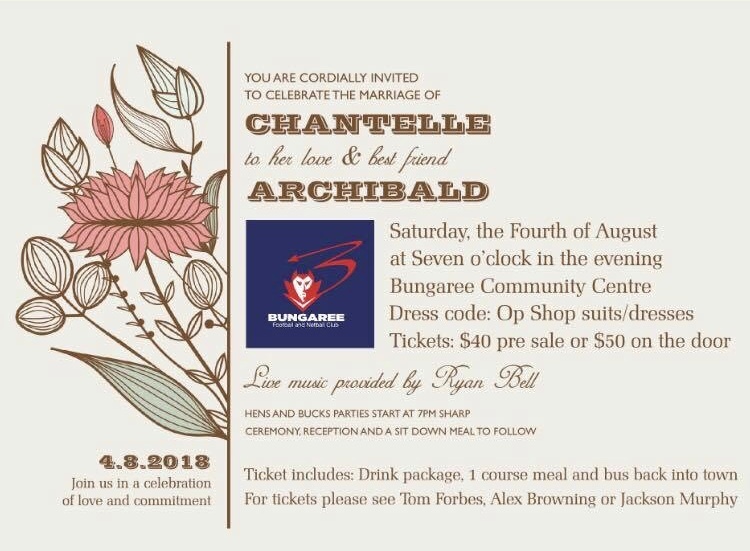 You are cordially invited to celebrate the marriage of Chantelle, to her love & best friend, Archibald. Live music provided by Ryan Bell. Hens & Bucks parties start at 7pm sharp. Ceremony, reception and a sit down meal to follow. Dress code for the evening will be Op Shop suits/dresses. Tickets are $40 pre sale or $50 on the door. Tickets include, drinks package, 1 course meal and a bus back into town. Please see Tom Forbes, Alex Browning or Jackson Murphy for tickets.